Today's was a classic topsy-turvy wet-to-dry affair, with safety car periods and the rest turning matters onto their head repeatedly. Even aside from that certain cars - and some highly unlikely ones - looked the class of the field at some points and also-rans at others. And that included Lewis. "Are all F1 races like this?" asked a local innocent apparently. Sadly not, but after a difficult weekend for the sport in some ways that it gave such a good account of itself when it most mattered on this important stage gave much relief and no little happiness. At the race's get-go the track was much drier than it had been at any point since early Friday when the notorious rains of this weekend started, though still it was perfidious and good only for intermediate tyres. Lewis led from the line after a, shall we say, robust move down the inside of Nico at turn one where he ran him out of road just as he did in Suzuka (it looked like Lewis knew what he was doing too), and just like then it lost Nico a few places. It was slightly more marginal than in Japan and they might even have touched indeed. Though also like then it still could just about be categorised under hard but fair. 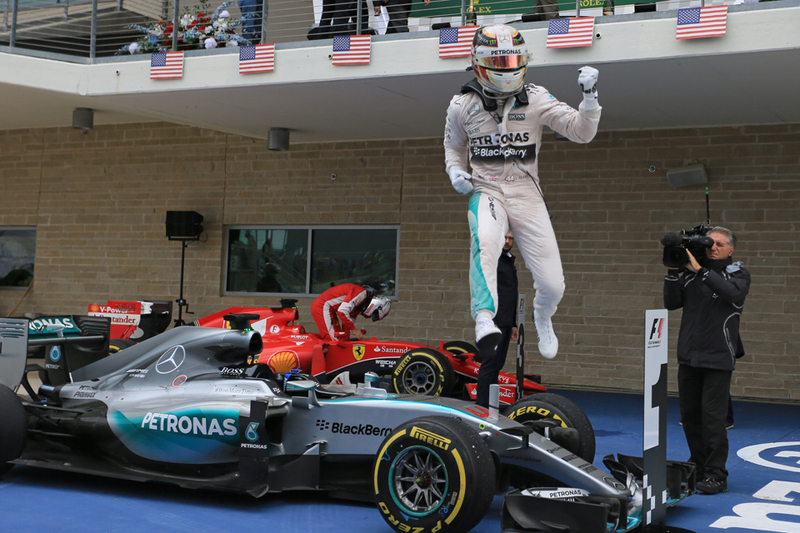 As a watching Juan Pablo Montoya noted, "I think he [Lewis] did what he needed to do". But in a departure from Japan, and most other races this campaign for that matter, Lewis didn't stretch clear, as the Red Bulls with Daniil Kvyat ahead were crowding him from behind in the early laps. 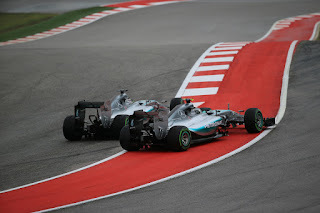 It looked like it was show over when at the end of an early Virtual Safety Car period on lap eight the Mercs undertook some unlikely teamwork as Lewis backed up the two Red Bulls which helped Rosberg pass them both on the first lap back under 'green'. But no, the Bulls were definitely happier on the intermediate tyres and Ricciardo four laps later got himself up to second in two corners after passing Kvyat as he went went trying to pass Rosberg then passing Nico as he went wide himself at the next turn. Ricciardo then wasted no time getting all over leader Lewis like a bad suit. The pressure was definitely on. "It was like I was driving on marbles...I was tip-toeing" Lewis said later. And come lap 15 Ricciardo sneaked by Lewis on the circuit's slow section to lead and not only that scampered up the road. And Lewis, with inters not working, sank back into the clutches of Rosberg and Kvyat. It was now time for slicks and Lewis having slid down to P4 immediately dived in to bolt them on, but it was a touch earlier than optimum as by the time the three ahead had switched themselves a lap later Lewis remained in fourth. Now on slick tyres normality appeared restored finally as the Mercs came back to life. 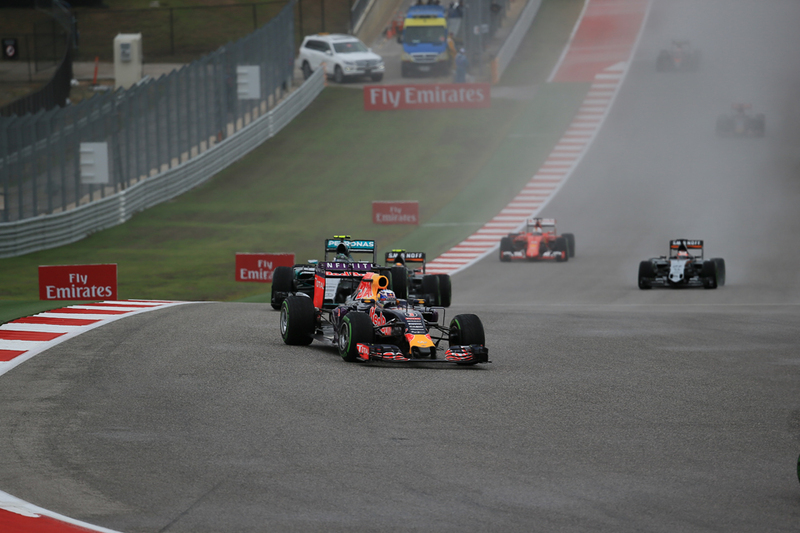 Rosberg on lap 22 seized the lead from Ricciardo and at the same moment Lewis passed Kvyat for third. Rosberg now showed amazing pace and, aided a little but not entirely by Lewis taking his time getting by Ricciardo, stretched away in vast chunks. If you're to to be cruel it appeared a little like a reversal of their usual roles - Nico imperious and confident; Lewis cagey and barely clinging on. It looked for a time that the race was in the palm of the German's hand. The Bulls later disappeared, and as if to emphasise what a strange day it was Ricciardo was later spotted battling for last place with Alexander Rossi, and only in the end salvaged the final points place. But the day then took another of its turns, as the safety car proper was employed on lap 27 as Marcus Ericsson parked his broken Sauber in an awkward place. This wiped out Nico's lead which was of the order of 12 seconds... Not everything about the Merc pilots' respective roles had switched evidently. Not long later though Nico's foul luck seemed to get equalised, as when the Virtual Safety Car was 'deployed' again on lap 38 (to allow the retrieval of Nico Hulkenberg's crashed car, as he'd collided with Ricciardo) Nico dived in for his second tyre switch, while Lewis - all presumably minded that he'd have to 'stack' - stayed out to lead. Nico now was in P3 behind Sebastian Vettel, who in that way he seems to do almost inexorably in 2015 was rising into the picture, this time from starting in fourteenth. When green flag racing returned Nico made short work of Seb who at this point was seeking to stretch it out to the finish on some rather used medium tyres. And now with Nico going to the end and Lewis still to stop as well as only about six seconds up the road and looking slower, it again looked like the race was to belong to the German. But then we had another turn, albeit it one of 90 degrees rather than 180. Kvyat binned it in a big way meaning the safety car appeared again. Lewis did his planned second stop (Vettel pitted too) and now was on Nico's tail with slightly the fresher tyres. 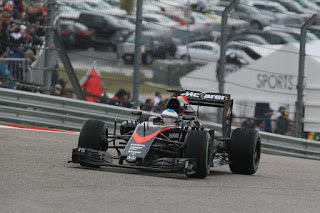 But still when arms were taken up again with ten laps left Nico looked to have matters under control. That was for a couple of laps, only then for Nico after what had been an immaculate run wherein he'd shown aggression we don't always think is in him and he'd overcome plenty of misfortune, dropped it. He got a tank slapper on under acceleration out of one of the hairpins and ran off the road. Lewis smartly nabbed the lead while Nico gathered it all up again and, finally, that was that. 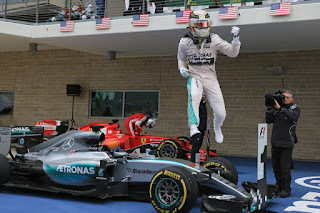 And as advertised in advance a Lewis win from Nico meant that Lewis's third title was wrapped up on the day. Nico just held off Vettel for second (one wonders if he was minded to let the Ferrari by to keep the title alive for Seb at least), and later was bewildered as to what actually had happened in that vital, pivotal moment. "[It] cost me the win" he rued, "that's really disappointing, a tough moment really, and such a strange thing that's never happened to me before. Never! Not in free practice, the whole season. To nearly spin off on my own like that coming out of a corner is just weird. I think the tyres were just a little bit cold maybe or something but I don't understand it...the race was mine". Partly due to this Rosberg had a face that could stop a clock afterwards; partly too he seemed to be nursing some wrath about turn one and all that. 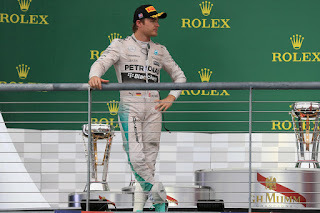 He didn't elaborate initally but later, while accepting it didn't impact on the result, Nico said Lewis therein was "too aggressive; one step too far" and that he was ahead so deserved the space. 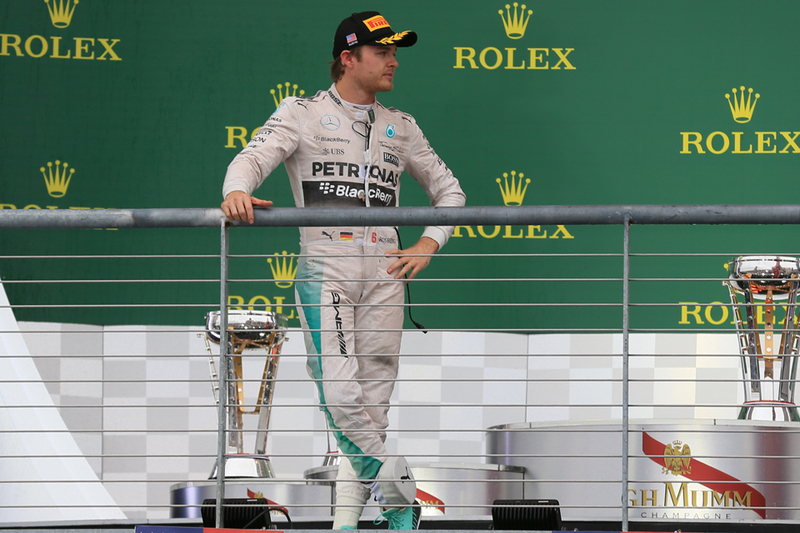 Merc's technical head Paddy Lowe later described the move as "tough". Nico did however pay tribute to his champion team mate. "Congratulations to Lewis, he deserves to win the championship, he's done a great season, he's driven well, consistent, so definitely well deserved" he said. While Lewis as you'd expect was highly pleased with life. "I feel very relaxed right now" he beamed. "I'm buzzing inside and can't find the right words to express the feeling but it's the greatest feeling for sure that I've had in my life". Lewis seemed about the only one in the place in Austin who didn't talk like this title was a formality in advance, and judging by his reaction after it became official that wasn't just talk. "Today was such a fun race" Lewis went on, "ups and downs and backs and forths, Nico was ahead, it was ten seconds at one point...then to come back with strength and [to] never give up...". Lewis also spoke eloquently about all of the people who'd helped him to get where he is, particularly his father in the early days. A job has been well done by all. With everything else going on it was easy to miss the worthy drives further down the order. And there were many of them. Vettel we've mentioned, then next across the line were Max Verstappen and Sergio Perez, both of whom benefited from a lengthy stint on a single set of tyres. Max looked typically racy at times too while Checo continues his recent fine form and glutinous points bagging. Then Carlos Sainz was followed home by Jenson Button, the McLaren even with its older spec engine not looking quite the easy meat that it has been (though as you've probably ascertained by now it was hardly a typical day), while Jenson as ever stayed out of trouble and looked good on a wet-to-dry surface. Fernando Alonso should have been in the mix too as he was running in P5 near the end before a sensor failure condemned him to sink to P11. He was another to have a day like an oscillation reading and his was probably more so than anyone's - he was wiped out by Felipe Massa at the first turn, meaning he had to change a punctured tyre, at one point he was a lap down indeed, before one of the safety car periods got him back into the action. 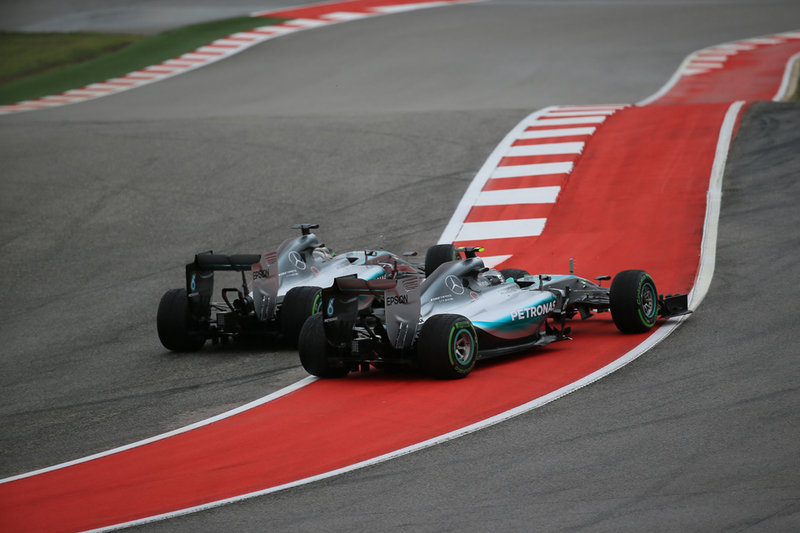 He remained however a long way behind Lewis, and Mercedes, at the front, much as just about everyone else was. While much has changed for Nando in the last 12 months in terms of the fight at the very top for him and all others little has. 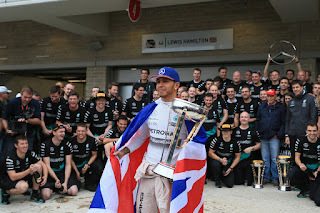 Precisely how Lewis will be usurped is no clearer than it was in Abu Dhabi in 2014. 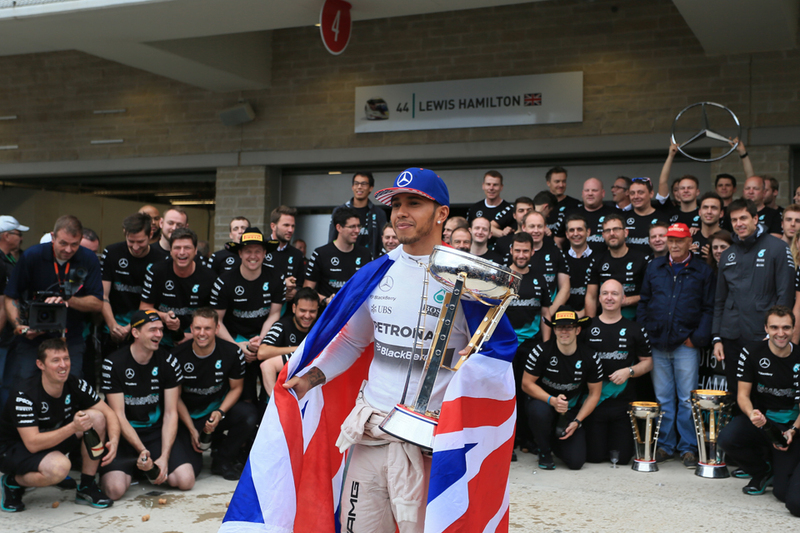 Right now you wouldn't bet much against three in a row, and title number four, for Lewis another 12 months hence.